The Legion of Mary is a lay apostolic association who commits itself to spreading the catholic faith among all peoples, inspired by and modeled after the Blessed Virgin Mary. 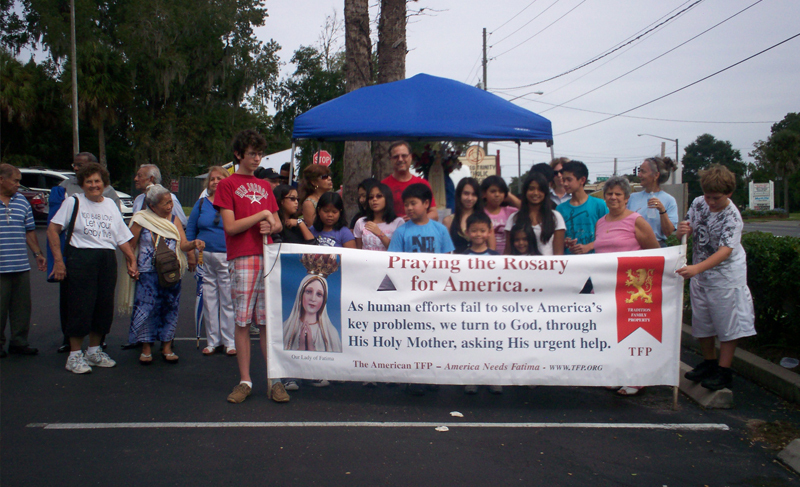 “Our Lady of Sorrows Presidium” for the English speaking community and “Rein Santo Rosario” for the Spanish speaking community. There are active members and Auxiliary members. Each presidium has a council of officers who include; the president, vice president, secretary and treasurer. The pastor assigned the spiritual directors for the two presidum and also assigns work for the members. The works of active members in our parish include; visitations of the sick and homebound, bringing communion to the hospitals and Nursing homes, bringing the pilgrim Virgin statue to houses to consecrate them, visiting parish families with newly baptized babies, crowd contact and distributing Catholic literature, religious articles, offer rides to Mass for those who need transportation, help to lead in public Rosary, lead rosary prayers in nursing homes and assisted living homes, organize prayer services, processions with the Blessed Mother in our parish and Marian feasts, and the promotion of other Catholic devotions as requested by the Pastor. Legionaries are sent to reach out to parishioners and Catholics who for some reasons do not attend Mass on Sundays or participate in any parish activities. They also invite and encourage parents to enroll their children to the GIFT program and bringing non Catholics to the inquiry classes. They do extension work of the legion of Mary by establishing new praesidium in the neighboring parishes. 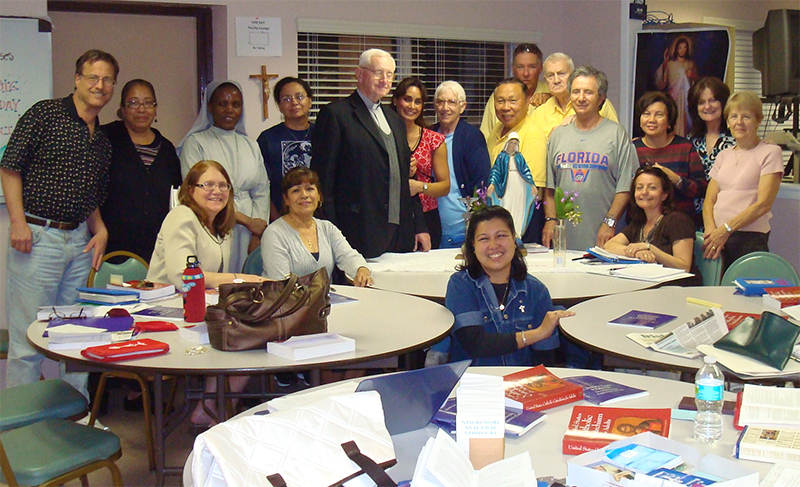 In 2007 a presidium was re-established at Immaculate Heart of Mary Parish. In 2009 another presidium was established at Christ the King Mission Church. We meet every week to pray, share our ministry reports, listen to a spiritual reading and study from our hand book. For spiritual growth and development the Legionaries prepare days of prayer and reflection. We go to retreat places like St. Leo’s Abbey, St. Joseph’s Carmelite Monastery in Bunnel, Holy Spirit Monastery in Conyers Georgia, The Basilica of St. Paul in Dytona and the Basilica of the National Shrine of Mary Queen of the Universe in Orlando. Some of our members have been to pilgrimages at Madugorje and Mother Angelica’s Holy Angels (EWTN) in Alabama. Some of these events there are opportunities to join with other groups in the parish or other praesidium. The annual Legionary Acies is one of the major spiritual events which unite all members (active and Auxiliary). They renew their promise to the Blessed Virgin Mary as our Queen and Our Mother. Legionaries are also committed to perpetual adoration and some active members to daily attendance of Mass (praetorians) as their spiritual practice to pray for their needs and those of the Parish. Priests and religious attend our meetings regularly to give us spiritual talks and to answer some questions where guidance is necessary. Auxiliary members are commited to prayer. They pray the Rosary and the Catena (Magnificat) daily. We invite friends, families and those interested to come to our weekly meetings as guests. After they have decided to be members, they start on a probation for three month and take their Legionary promise to the Blessed Mother.